AAHA Infection Control, Prevention, and Biosecurity Guidelines. 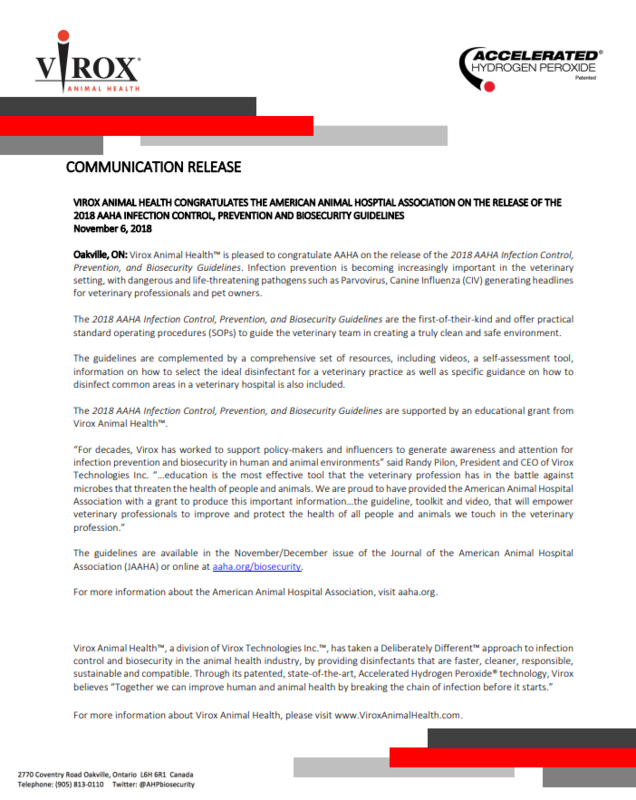 Virox Animal Health™ is pleased to support and congratulate AAHA on the release of the 2018 AAHA Infection Control, Prevention, and Biosecurity Guidelines. Infection prevention is becoming increasingly important in the veterinary setting, with dangerous and life-threatening pathogens such as Parvovirus, Canine Influenza (CIV) generating headlines for veterinary professionals and pet owners, hence the importance of providing guidance in creating a truly clean and safe environment. NAVTA is led by an engaged Executive Board and Executive Director, and embraces committees to help drive initiatives forward. These committees are made up of NAVTA active members, and are led by a chairperson. Committees have individual structures, term limits, numbers of seats, and focus. Currently, the incoming president appoints chairpersons. Members wanting to sit on a Committee or Chair a Committee are nominated either by themselves or other active NAVTA members. These Interim Guidelines have been developed by consultation between the American Veterinary Medical Association and the U.S. Centers for Disease Control and Prevention and are advisory in nature. They are intended to provide guidance for the care of animals entering shelters and for persons working with or handling the animals in response to natural disasters.